The oldest of the four Inns of Court, the historic buildings are set in beautiful, private grounds in Central London. From the medieval to the modern, a range of versatile venues to suit all occasions. 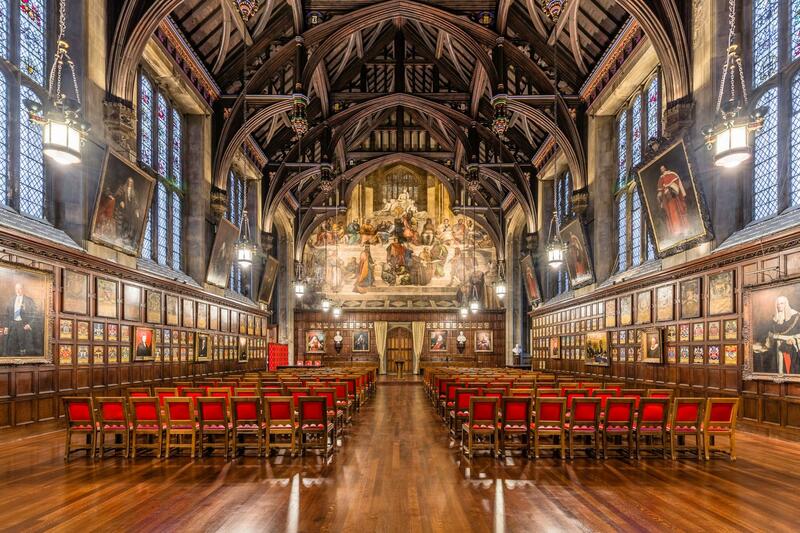 Opened by Queen Victoria in 1845, the Great Hall complete with Minstrels’ Gallery and ceiling of beautifully worked oak is described as one of the most impressive surviving buildings of its kind in London, designed by Philip Hardwick working in the Tudor Revival style. On the North Wall is a huge and magnificent fresco executed by G.F. Watts, the Pre-Raphaelite painter, showing the world’s law givers from Moses to Edward I. By day the Great Hall operates as a dining hall for barrister members of the Inn. By evening this historic Hall transforms into the perfect setting for grand dinners for up to 250 guests or elegant receptions for up to 450 guests. The Great Hall is also available at weekends and provides a stunning setting for an exclusive wedding reception. This building also boasts our adjoining Bench Rooms and an east facing terrace with views of our private gardens, perfect for an arrival reception. The Old Hall, dating back to 1490, is a wonderful example of beautifully maintained Tudor architecture with original roof timbers, stained glass windows featuring armorial bearings, and Hogarth’s painting of “Paul Before Felix”, creating a desirable setting for intimate lunches and dinners for up to 120 guests, celebratory receptions for 200 guests and inspiring seminar events for 130 delegates. The Crypt beneath the Old Hall was for centuries used for storage of fuel, food and wine. Now the brick groin vaulting has been restored to its former glory and is used as a reception area. Opened in 2018 by Queen Elizabeth II, the Ashworth Centre provides a stylish purpose-built double height Lecture Theatre with tiered retractable seating for 158 delegates, along with a suite of ten meeting rooms split between two floors, expertly designed to allow natural daylight to flood each room through generous skylights. The glass ceiling in the adjoining communal foyer provides impressive views of the Great Hall turrets above. This new conference suite is named after Mercy Ashworth who was one of the first women to be called to the bar at Lincoln’s Inn in 1923. Our Members' Common Room and Old Court Room will be available from late 2019. Please contact the events team for further information.